The govenment has made a new strategy for science on Svalbard, which involved several changes in the task of Kings Bay and the Norwegian Polar Institute. We all have to get acquainted with these new roles. NPI will be more actively involved in science coordination and Kings Bay will more focus on facilities. There is also a new director of the board appointed: Tor Instanes, director of Marineholmen, in the middle of the picture. 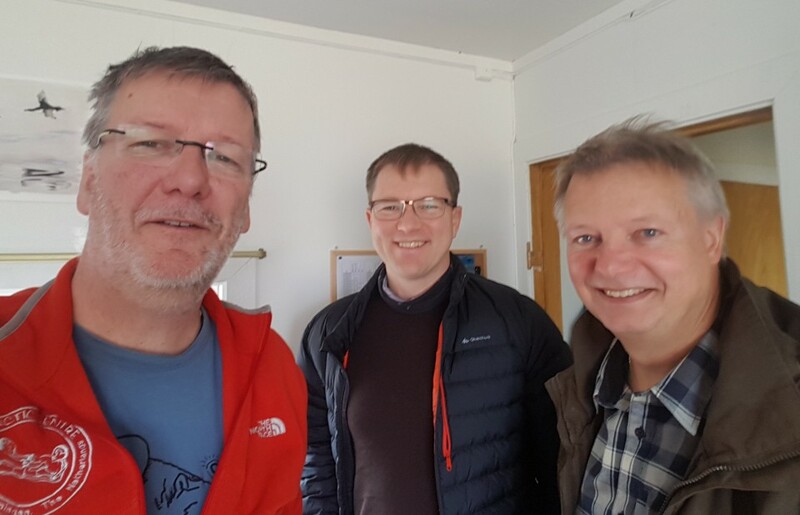 Together with his friend Tore Johan Smidt (to the right on the picture), who has been doing construction work on Svalbard long ago, he is visiting Ny-Ålesund. They have presented themselves to the personal of Kings Bay and the stationleaders. And they visited the Netherlands Arctic Station to learn about our work and to hear our view on future Ny-Ålesund. It was a very pleasant and open discussion.